Saracens' Owen Farrell has hailed team-mate Jacques Burger's defensive effort during their 46-6 Heineken Cup semi-final victory against Clermont Auvergne. Man-of-the-match Burger put in 27 tackles during the record-breaking win against the French side at Twickenham. 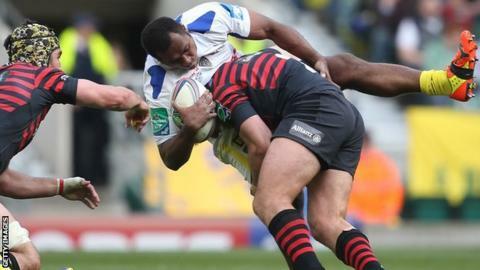 The 30-year-old back rower from Namibia is still recovering from a career-threatening knee injury. "He's a massive asset for us," said Farrell. "You talk about putting your body on the line, there's no one that does it more than him. When you see people hitting like that it makes you want to do it. "I know if I was playing against him, you'd be looking for where he is all the time because you wouldn't want him hitting you from the blindside," added Farrell, who scored one of Saracens' six tries in the win. The Aviva Premiership leaders set the record for most points scored and biggest winning margin in a Heineken Cup semi-final. England fly-half Farrell, 22, recovered from a foot injury to play but ceded kicking duties to Alex Goode, who slotted 13 points. "I've trained fully for two weeks, but I've not done as much kicking," Farrell explained. Saracens will face the winner of today's second semi-final as champions Toulon meet two-time champions Munster in Marseille. The final will be played at Cardiff's Millennium Stadium on May 24. Farrell added: "We'll enjoy this win, it's a big occasion for us, but we want to be used to this. We want to get better, and go on again and show what we can do in the final."